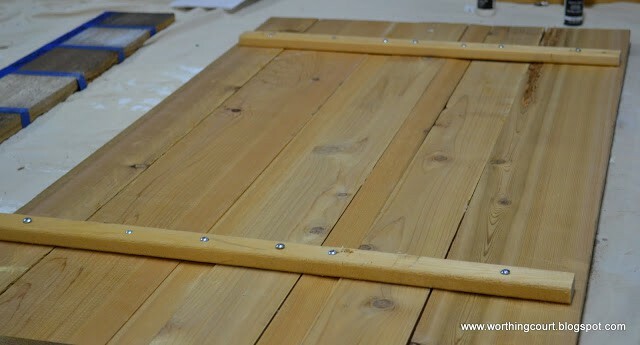 UPDATE: Enjoy this great tutorial for making brand new wood look like old barnwood. All of the photos were taken in the basement of our previous home. Click HERE to see our new home that we’re completely remodeling. If you live in the city, like I do, and don’t have any friends with an old barn in their backyard, like I don’t, you may find it nearly impossible to find gen-u-ine, old wood from an old barn. I searched Craigslist and all kinds of online sources to no avail. There is a lot of rural area within minutes of where I live so I thought that surely someone would realize what a gold mine they have and would be selling it online. But nope. Nada. Nothing. Bummer. Old barn wood is what I was after to create a backdrop for the rustic vignette that I put together for the top of the new entertainment center in my basement family room. See those boards standing up behind the accessories in the below picture? That’s exactly the look that I was after. The long board in front, with sectioned spaces, is a sample board that I made trying to mimic that look using new wood. First of all, I went to good old Google to do research on “how to age new wood”. I was all set to use a method using vinegar and steel wool on some new pine boards. I even went to Lowes to buy all of the supplies. BUT – as I was walking down the aisle, I saw that Lowes carries boards made from cedar in addition to the regular everyday pine that we’re all used to. One side of the boards was rough and one side was smooth. Sweet! My plan quickly changed. I decided that I could use the rough side of the boards along with stain and paints to get the look I was after. I applied translucent gray stain, brown stain and black and white acrylic paints in several different combinations to a piece of the cedar to see which look I liked the best. Painters tape worked great for sectioning each sample off. If you look closely, you can see that I labeled each section with a Sharpie so that I could remember what combination each one was. I decided that the sample that was the closest to what I was after was the fourth one from the left – gray stain with black acrylic paint lightly dry-brushed on the top layer. The gray stain that I used is Rustoleum Ultimate Wood Stain in the color Sunbleached. I used a combination of 1×2’s, 1×4’s and 1×6’s to come up with a 48″ x 24″ aged wood backdrop. I didn’t care how the different size boards were combined together and I wasn’t all that concerned with how well the ends lined up since I wanted it to be rough looking. I started off by laying my boards on a table with the smooth side up and attaching them all together by screwing a piece of scrap wood close to each end of the boards. I ran a bead of carpenter’s glue along the scrap for good measure. Make sure you put a screw into each board. I then flipped the whole thing over so that the rough side was up. I used a rasp to rough up the edges of the boards a little and take away that “new board” look. I brushed on the gray stain, quickly wiping it off with a rag as I went. Then using a dry brush technique, I lightly applied black acrylic paint here and there, quickly wiping that with a rag too. Even Pookie (who didn’t notice the Christmas mantle until after I blogged about it even though it had been decorated for two weeks and is right beside his chair) commented on how much it mimics the look of real gen-u-ine old barn wood. Easy peasy and I didn’t have to put up with the smell of any stinky vinegar! Wow, you did a great job making that wood look old. 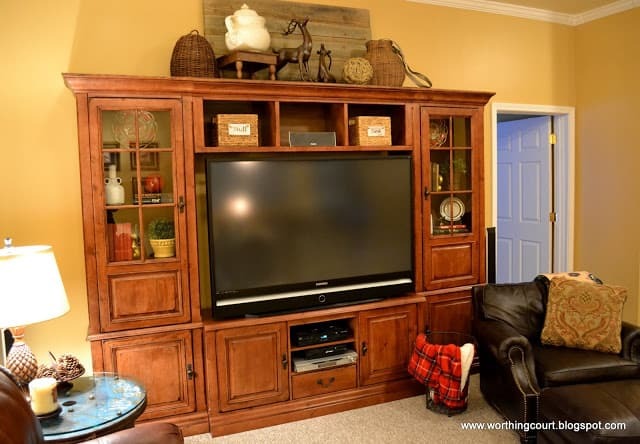 My entertainment center looks almost exactly like yours so you have given me some ideas! You may not have real old barn wood but no one will know. You did a great job. I love google you can find anything. Wow…this looks fantastic Suzy…..great job!!! This came out great, I will save this for the future. Thanks for sharing. love how you used different combinations to find what you wanted to look like! great job! Suzy, This is a keeper for sure! Aging new boards has always puzzled me too! I thought of buying boards and letting them literally rot in my back yard! Great tutorial! Will you share this at Tutorials Tips and Tidbits? Link goes live Wednesday at 8:00 pm. I love this Suzy, and I’m glad you didn’t decide to just “find” some old barn wood on one of your country drives. Your method is much better than trespassing on some good ol’ boy’s land! This is great, Suzy! Thanks for all the tips. I love the look of your “old” barn wood. Very nice job! Looks great on the entertainment center. Thanks for sharing. I love it Suzy! I will definitely have to give this a try. It looks so good behind all your pretties. I’m painting my laundry room this week and YOUR laundry room post will be looked at many many times 😉 I dream about your laundry room -LOL! Really, I do. If Pookie noticed, you know it’s a winner! Love the idea of using a rasp (although at first glance, I thought it was a cheese grater)! Looks like a fun project. It came out great! 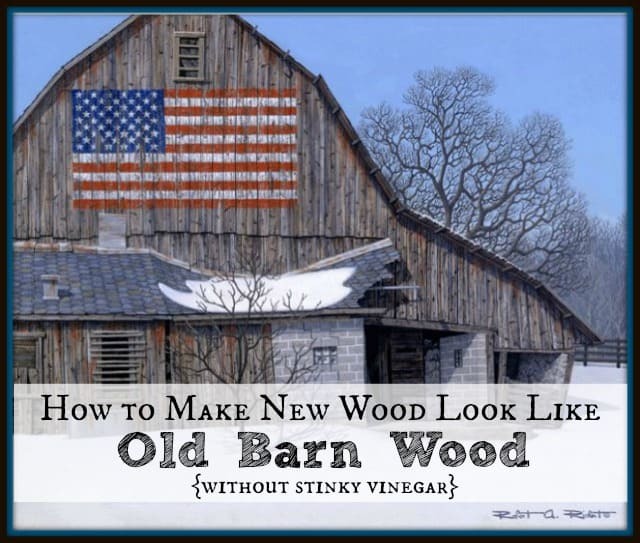 This is such great info ~ I love old barn wood but instead of making my own I’ve always sulked that I have never come across any ~ I will sulk no more and will be sure to try this technique soon! P.S. That barn at the top is so Americana – love it! Suzy, The boards turned out wonderful and your mantle is beautiful. Thank you for linking to the Open House party. I’m curious the combination of stain/paint/etc. you used for the swatch furthest to the right? I first dry brushed black acrylic paint onto the bare wood, then brushed stain over that, quickly wiping away the excess. The stain that I used is Rustoleum Ultimate Wood Stain in the color Sunbleached. What a good job, years ago when i was still married, my wife and i liked the rustic look. I had made some signs and wanted them to look old so i got some new wood and aged it myself with stain ,paint and very dark coffee even scraped some rust off some steel and rubbed on around the nails i used to hold all together. I wish i had some picture to show you, they turned out great, I had friends come over and they to liked the rustic look and asked where i found the old boards to make the signs. Hi Suzy! I am so glad I googled this! I want to make a headboard with “barn wood” and I can’t find it anywhere, I would like mine more worn looking… wondering if the far right stain would be better for me? and maybe I’ll beat it up with a chain? what brand stain did you use? Hi Shelly. 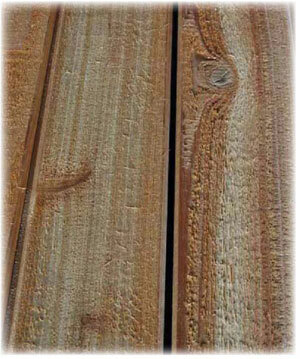 I would buy a piece of whatever kind of wood you’re planning to use (I like cedar because it’s already a little rough) and experiment on it to see what color you like. 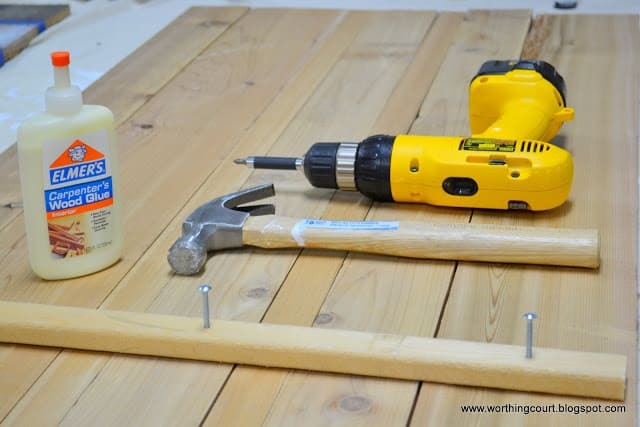 You can get totally different looks just by changing up the order of how the stain and paint is applied, how much of it you use and how long you leave it sitting on the wood before wiping it off. I wasn’t picky about the brand of stain that I used – it was whatever gray stain Lowes happened to have. I think that beating it up some with a chain is a great idea. 🙂 I love that treatment so much that I think I’m going to use it again on a half wall in my basement. I want to beat it up with a chain and a hammer some to make look more aged. I’d love to see your project when you get it finished! This is great! 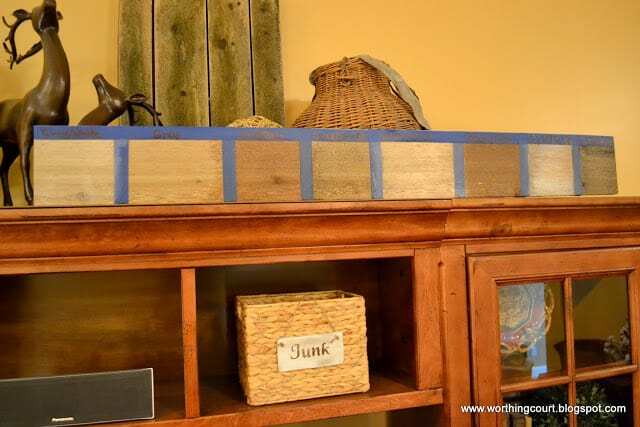 I’ve been looking for Barnwood to use on some projects, but haven’t found any, so I’m going to try this! My question is what kind of acrylic paint did you use….when I think of acrylic paint, I think of a little tube used on canvas! Lol also, I have dry brushed once before, but do you have any tips? Thanks for your help! Hi Samantha. The acrylic paint that I used is just the craft paint that comes in small bottles. I don’t have any experience with the type that is used on canvas, but I don’t see why you couldn’t use that as well. The biggest tip that I have for dry brushing is to add paint to your brush and then wipe almost all of it off on a paper towel or rag. You want very, very little paint on your brush. Remember – you can always add more paint, but you can’t take it away! If you haven’t done much dry brushing, I recommend experimenting/practicing before actually starting on your project. Hope this helps, but let me know if you have more questions. Hi Suzy, This is Jana Collins. I wrote to you a few days ago asking about the tureen on top of your entertainment unit. Thanks for getting back to me so quickly. On the same subject I have been looking all over for a basket like the one on top of the entertainment unit. The one with what looks like a leather strap accent on it. Keep in mind I live in Idaho where there is not much shopping. Did you find that in NC or on your travels ? Thanks for letting me bug you with that question. I think I need to make a trip to NC to shop ! Hi Jana. You aren’t going to be believe this, but the basket came from the same place, on the same day, as the tureen. I’m sorry – I know I’m no help at all! It too was a prop in a High Point Furniture Market showroom. Try doing a Google search on ‘fishing baskets’ – several resources will pop up. And yes – come on down – I’d love to shop with you! I have done tons of research on aging wood. This is by far the best and real looking aged barn wood I have found yet. 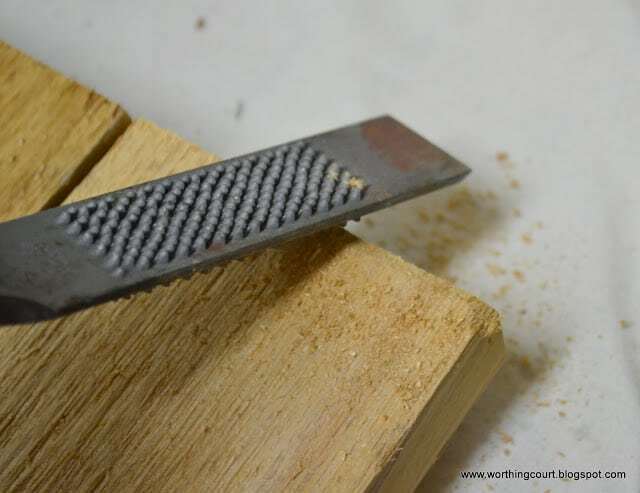 I use a wire wheel on a drill to distress the wood and it works amazing, however I will try the rasp next time. That just looks absolutely awesome! Great job! Thank you, Kevin! I love your idea for using a wire wheel to distress the wood. Thanks for the information. Exactly what I was looking for. Great photos as well. Good work. I just have to say that this is one of the better recipes for an old barn wood look. Great job and thanks for sharing! Where did you get your deer figurines? Or who makes them? I love them! Hi Heather. Gosh – I bought those things several years ago. I don’t remember the exact place, but I think it was maybe at Carolina Pottery??? If not there, it might have been at Garden Ridge. I’m sorry I can’t remember exactly! If I think of it, I’ll send you a note. Hi, Excellent sample board. I love the third from the left. Could you share that recipe? Many thanks. 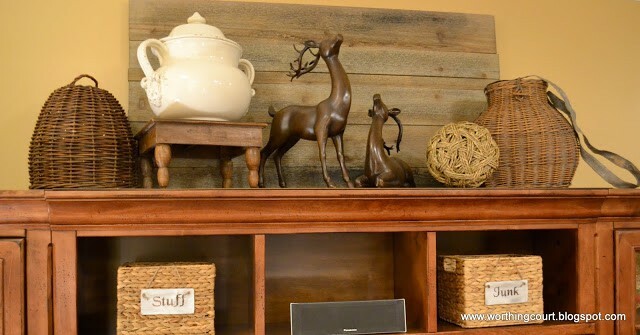 I really love the way that the barn wood looks at the background of your mantle, it’s very subtle and a great change. I’ve been looking for a way to upgrade my mantel to where it can look very great with small changes. My wife will probably really love the look that barn wood brings to the table, I might have to start looking around since I’m not creative enough to get the look correct.